Amazing indeed. A new discovery of an 800-pound tortoise in the Amazon appears to look like kaiju favorite Gamera--because it was Gamera, tusks and all. On November 22nd 2013 both International Business Times and iMediaEthics both reported on the false story of a newly discovered giant tortoise. The biggest source for this hoax was News-Hound.net. You can see the news clipping below. The article continues on with the initial discovery of species, eating habits and nesting habits. 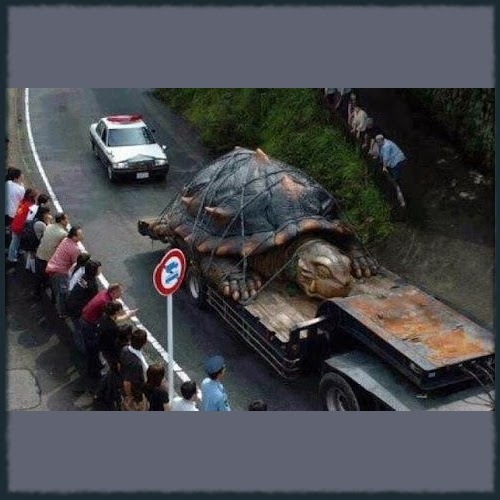 iMediaEthics breaks down the media outlets that reported this viral story that began last year and includes links to those original stories that circulated about the "Giant Tortoise". Sites that have run the tortoise story include Topekas News, News-hound, and the Tottenham News. None of the three have About Us pages explaining what the sites are. 1. Topekas News story about the tortoise was headlined "Giant Fukushima Mutant Turtle Finally Captured By Japanese Military." The Topekas News spun up a tall tale even saying that the tortoise had been nicknamed "The Great Demon King Koopa (Bowser)" and that the U.S. military was instrumental in catching the monster creature using drugs and explosives in its food. TopekasNews wrote that a U.S. soldier said the beast was "running a good 20 miles per hour." "Some residents claimed at night its eyes would glow red as it emerged from the waters, usually hungry for small children or cattle, but its appetite knowing no true limit. Other residents say the great demon turtle could be heard wailing in the distance, bellowing out toward the heavens and speaking ancient Japanese, the words they say were a call toward the dark gods of ancient." The absurd Topekas News article went on to claim nuclear power was responsible for the tortoise and that the "mutant" ate a bunch of animals. "Unfortunately, the giant mutant attacked the town of Noto, Japan," Topekas News wrote. "It literally tore through dozens of houses, ate 3 grown tigers and several goats at the local zoo, leaving a brave injured bull elephant to die, and then tried to eat a butcher’s van that is used to haul meat. " 2. 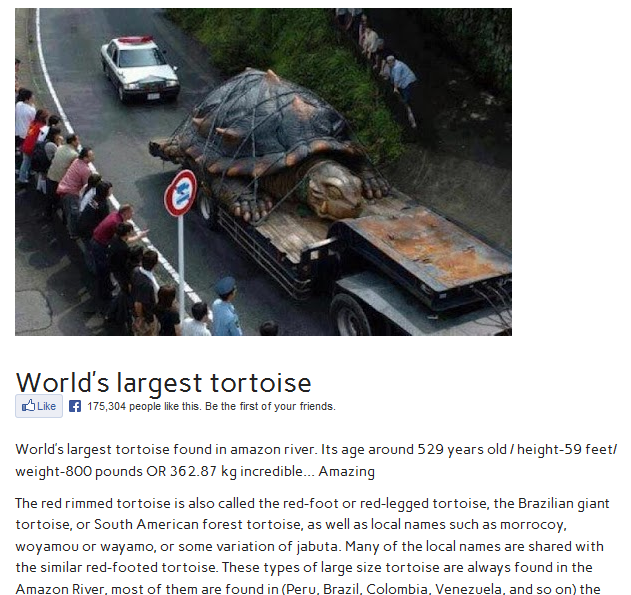 News-Hound posted a story Nov. 21 titled, "World’s Largest Tortoise found in Amazon Basin – 800lb." Unlike Topekas News, which is a site filled with satire, News-hound apparently publishes viral news stories with clickworthy headlines. It also doesn't have an "About Us" explaining the site's purpose, but judging from headlines, the content appears to be sensationalized news stories, not satire. 3. The Tottenham News was also a victim of the turtle hoax story, according to the International Business Times. The Tottenham News story is headlined "World's Largest Tortoise Found in Amazon."